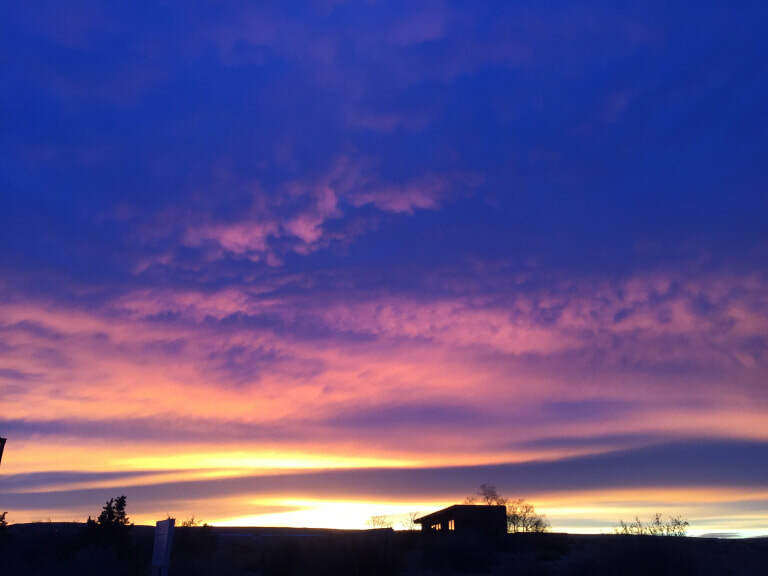 We as ABQ YAVs spent this past weekend on a silent retreat at the beautiful Norbertine Community here in Albuquerque. The Saturday of silence started with morning prayer at the Santa Maria de la Vid Abbey, followed by 10 hours of silence, and then evening prayer once again at the Abbey. 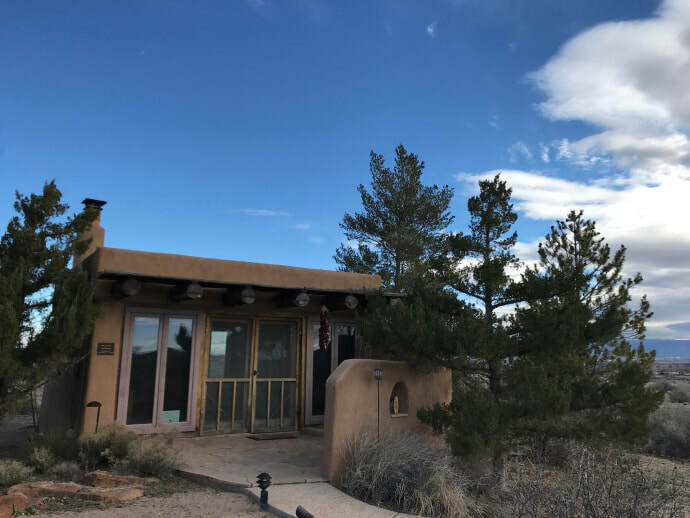 There was quite a bit of build up and anticipation for this silent retreat because being left alone with your own thoughts for 10 hours seems a little scary but I was looking forward to the experience. The silence provided a nice opportunity to turn my phone off and to choose to be present and aware of God while knowing the rest of the world continued to live their lives as just another day and that everything would be okay. The idea of engaging in complete silence, thinking of nothing and just being is not new to me. Unfortunately, I am often forced to use the meditative and biofeedback practices of focusing on nothing, blocking out the world (especially pain), and focusing inward when I get migraines. For those of you who aren’t familiar with biofeedback, it is a technique used to learn to control some of your body’s functions such as heart rate by monitoring yourself by using electrical sensors. Biofeedback was presented to me as a way to manage pain by focusing on my whole well-being meaning body, mind, and spirit and has been highly useful to me not just to control pain but to relax. When I experience migraines and have taken my medication the only thing I can do is just sit and be in silence. I can concentrate to relax one muscle at a time, use internal imagery in order slow my breathing and open blood vessels to increase blood flow in my body and get rid of the bright aura colors I often see. Biofeedback and meditation are two practices I quickly learned and put into practice when I was 14 and have since perfected due to necessity but I always like to have the opportunity to them into practice for enjoyment as well. Taking intentional time to just be with nothing to do and nowhere to go in what otherwise is a relatively busy and scheduled life provided a nice peaceful space for deep relaxation. I didn’t bring any activities to do except for two books to read. We had nice weather this weekend so I time enjoying the meditative walking path as well as just sitting outside. I liked embracing the silence. 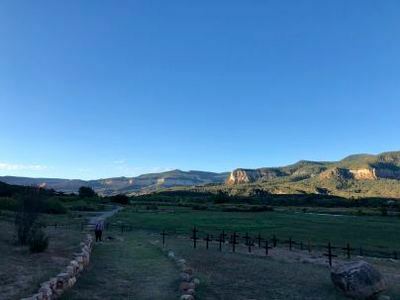 I am not going to pretend this retreat was some life-changing experience for me or that I think continuous hours of silence will reveal some deep insights for you. The silence was nice, peaceful, calming, centering and relaxing. 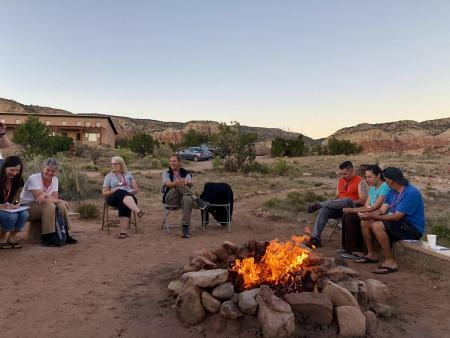 Being in silence isn’t something you need to go on a retreat to do but being in our intentional community before and after the silence added to the experience. Simple silent breathing techniques and meditative practices are things I like to include in my day to day life at work and before I go to sleep as a way of remaining grounded, centered and calm. For Lent, I will be taking on an increase in the amount of time I set aside for meditation each day. I would encourage you to try to increase your relaxation and meditation time in an effort to know that you are loved by just being. To read more from Kim, click here. Change …it’s inevitable. It’s always gong to happen and come around. The question is do you want to be a part of the change that will inevitably come for the better or for the worse? I think most privileged people are always saying change is hard, it’s too hard why not just keep everything as it is? No, what's actually hard about change is realizing the injustice that has integrated itself into our society to where we now think it’s the normal. Changing our perspective on how we function as a person, a community, a society, social group classes or on the grander scale a nation as a whole. This weekend as ABQ YAVS we were blessed enough to be able to attend the 23rd Annual Dr. Martin Luther King, Jr community commemorative breakfast. At this breakfast we got to hear from some amazing speakers, the Honorable Tom Udall Senator of New Mexico, Mrs. Elizabeth Kristen-Keller First Lady of the city of Albuquerque, Reverend Dr. D Charles Wharry, presiding elder Arizona New Mexico district, Reverend Donna Marie Davis pastor Grant Chapel AME Church, Reverend Michelle Sumbry Albuquerque New Mexico and Bishop Vashti Murphy McKenzie, Presiding Prelate 10th Episcopal District of the African Methodist Episcopal Church. These men and women stood before hundreds of people and talked about injustice, change and most importantly faith and having the courage to stand up against oppressors to enact social change and to always remember that it’s up to us to keep Dr. Martin Luther King, Jr’s dream alive. To not have violence against violence but to have kindness be the weapon of our choosing, to using all of our voices as a whole over the use of our fists or firearms to be heard. We will never be able to control people’s opinions but we can show them how to change them if that is their wish, through selflessness, standing up for what is right, even if it makes you uncomfortable(especially if it makes you uncomfortable). Change happens all the time changing houses, jobs, friends, lifestyle, etc…what should never ever change is being kind to one another. Respecting someone as a human being standing up for the unjust, for the ones who are meek, the ones who get passed over without a second thought, the ones who voices get taken away just because they’re different or weren’t born here or because one(or more) group(s) think that they’re superior because of who their parents are or what school they attended or whatever their mindset may be. I personally forget some of this. I get too caught up in my own trials that I forget to use my voice, my power, my vocation to assist. Am I going to be the person to change the whole world? Probably not. Am I going to be the person who strives everyday to assist and stand up for whats right no matter how “uncomfortable” it makes me? Absolutely!!! Knowing your strength is crucial, knowing that yeah I may just be one person but I do have the power of change for the better. Just accepting thing because that’s the way they’ve always been has come to an end. This is a battle of unjust that has been going on for centuries, it’s time to quit being scared to stand up for what you know is right. it time for change. Change….it's inevitable…know where you stand. ​I typically find myself to be a joyful and enthusiastic person, however, lately, I have been struggling to remain joyful. To maintain a positive outlook in my life as an ABQ YAV I have found myself redefining joy to focus more on the little things in my life. Finding joy in the little things helps me to not become overwhelmed by negative people or situations. 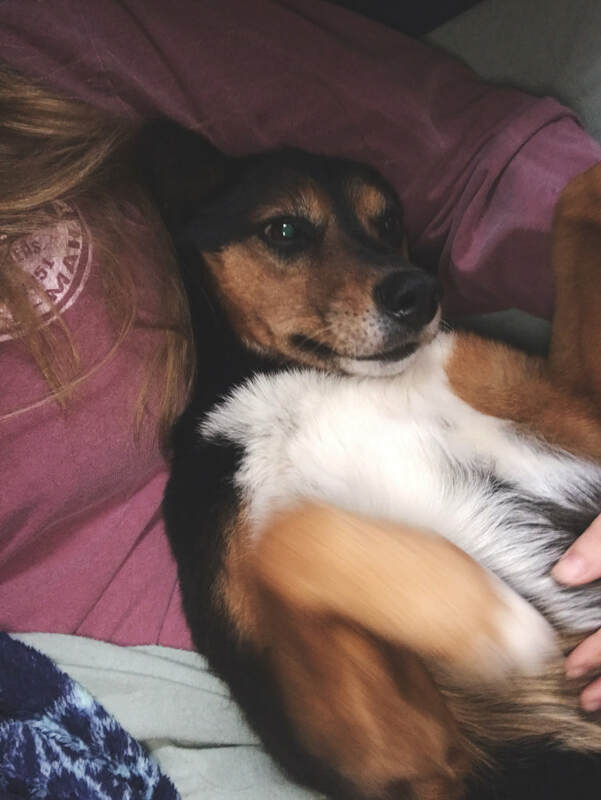 I recently found a lot of joy going on long walks and cuddling with Mica (an adorable dog we were watching). I find joy in daily conversations with kind, passionate, and dedicated people I have the privilege of working with. I find joy when I am able to joke around in Spanish with some of the residents at the shelters. Some days I find so much joy and fulfillment in doing my job I forget to set aside time for self-compassion and rest and I am working on that. 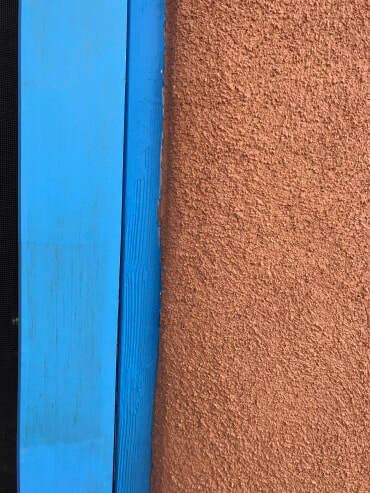 Some days joy is evasive, and I find it in seeing some bright colors incorporated into the southwest adobe architecture around me. On days when finding joy seems impossible, I am lucky to have people who I know can easily help me add a little joy to my day. Focusing on finding joy in ordinary moments has helped me relax because I am no longer worried about chasing extraordinary moments and I am finding it easier to be fully present in every moment. Being able to find joy in ordinary moments has become important to me so how do you define joy and where do you find it? To read more from Kim's blog, click here. 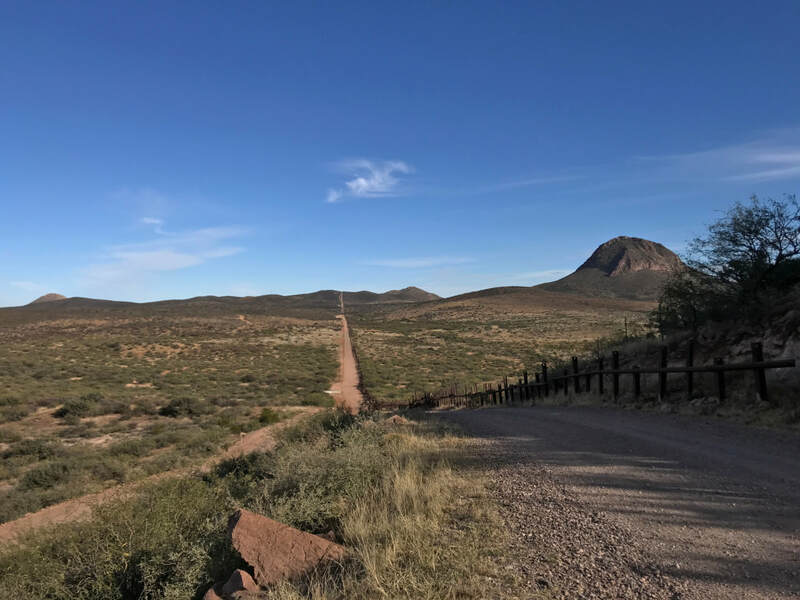 I recently spent time crossing between the border towns of Douglas, Arizona, U.S.A. and Agua Prieta, Sonora, Mexico with a group of 11 other YAVs, our site coordinators, and leaders of an organization called Frontera de Cristo. During this week, we were continuously welcomed into homes, resource centers, bible studies, and churches as we struggled to learn what life is like for those on the other side of the border. All throughout this week, we carried with us the privilege that will forever keep us from fully understanding – the privilege of being able to cross smoothly through the port of entry over and over and over again – the privilege of being U.S. citizens. Now, I invite you to struggle with me, as I try to figure out how, as a white privileged woman, I can share the stories of those I met and what I experienced without shifting into the all-too-easy white savior. 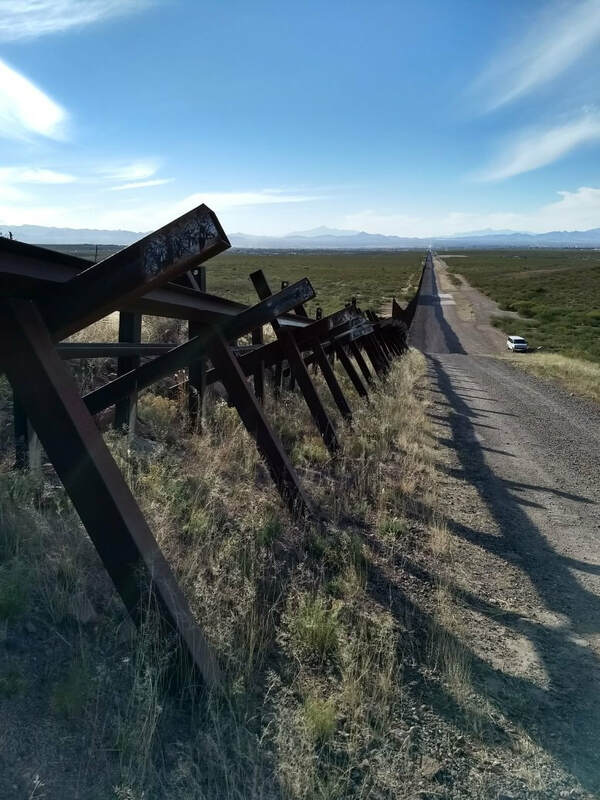 I don’t claim to be an expert or to fully understand the complexities and nuances that affect our Southwestern border and all those that come into contact with it, but I do know that as a U.S. citizen, as much as I don’t want to believe it, this is my border. My wall. My responsibility.And I think it’s probably yours too. It’s time we own this. What I witnessed in the ways our immigration system is implemented each day simultaneously shatters my heart and enrages me. However, out of my experience at the border also come stories of love, gratitude, faithfulness, and hope. I hope that these things will stick with you as we begin examining the ways in which we as U.S. citizens are implicated in this. On our first full day, we were invited to dinner at a migrant resource center called C.A.M.E., where we heard about the work that they do in helping migrants and asylum-seekers in all stages of the process. C.A.M.E. 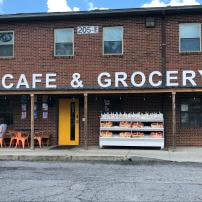 provides warmth through a place to sleep, the filling food they offer, and the kind people that work there non-stop each day. Over the simple act of sharing a meal, our YAV group each heard stories of those that were staying at the shelter. 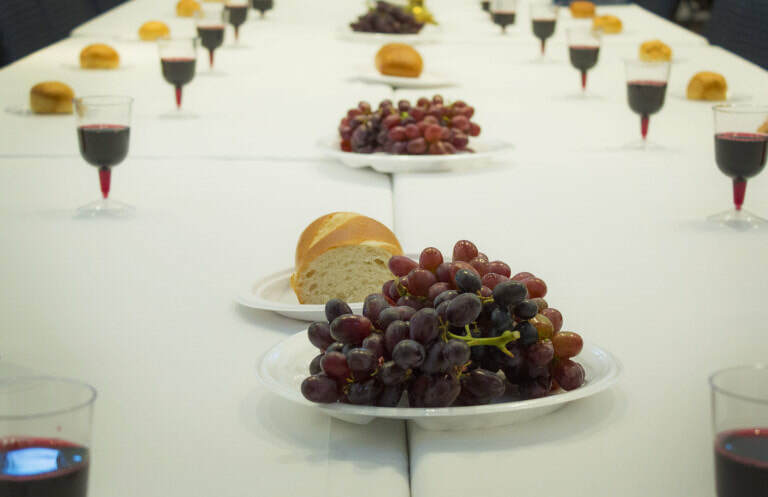 Spread out around the dinner tables, some listened to migrants who had spent twenty years working in the U.S. to only be suddenly deported. Others heard the stories of a group of trans women that had experienced terrible violence in their home countries and were traveling together to seek asylum in the U.S. I listened to a pregnant women from Honduras who was traveling with her teenage daughter and hoping to be granted asylum so that she might join her family in Georgia. Through a few tears and a brave smile, this women, who shall remain anonymous, shared with myself and a couple others in our group the details of her journey and her hopes for the coming months. She described the unstable nature of her home country and the intense poverty they could not escape, and how, to her, this was her only option. She was leaving behind two young children, who were staying with her mother, and though this seems unthinkable to someone of my privilege, she had to do something to create a better life for her family. All she wants is a steady job that will earn enough for a small house for herself and her children. Part of the beauty in this interaction was the lack of Spanish speaking skills of myself and the other YAVs at my table. After many Spanish classes, I can keep a conversation going (all in present tense, of course), but I don’t have the knowledge to fully converse on a subject of this magnitude. However, this meant instead of talking, we listened, and I think that is incredibly important as we strive to do liberation work in solidarity with those that are directly affected. Our new friend was continually patient with us as we tried our best to understand. At the end of the night, we thanked her for her courage and for sharing her story with us. We wished her the best as she went to the port of entry the next day to request asylum. I walked away grateful for hearing her personal journey but also thinking that I’d never see her again. As often happens, I was wrong. The next evening as we crossed the border to join a weekly prayer vigil, I heard someone say my name. I’d vaguely noticed people sitting along the wall, but we were running late and I was digging through my bag for my passport. When I heard my name, I looked up, and there was our friend from the night before. Immediately, a rush of embarrassment flooded through me, and even writing this now, I feel it again. It was in this moment that I felt the weight of my privilege crash down on me in a way that it never has before. As we were being waved through the port, I barely made out an “hola, ¿como estás?” I immediately regretted not getting out of line and actually acknowledging her and her daughter. I felt ashamed that I was too caught up in my own life to notice her, and I felt furious that I was able to cross so easily yet she could not. As we continued on with our evening, I could think of nothing else except our friends sitting by the wall, not being allowed to set foot on U.S. property, meaning that they couldn’t get close enough to request asylum. I also couldn’t stop thinking about the ways in which I had just been personally a part of perpetuating our broken and oppressive immigration system. Later on that night, a few of us went back to the border crossing to see if our two friends were still there; they were. 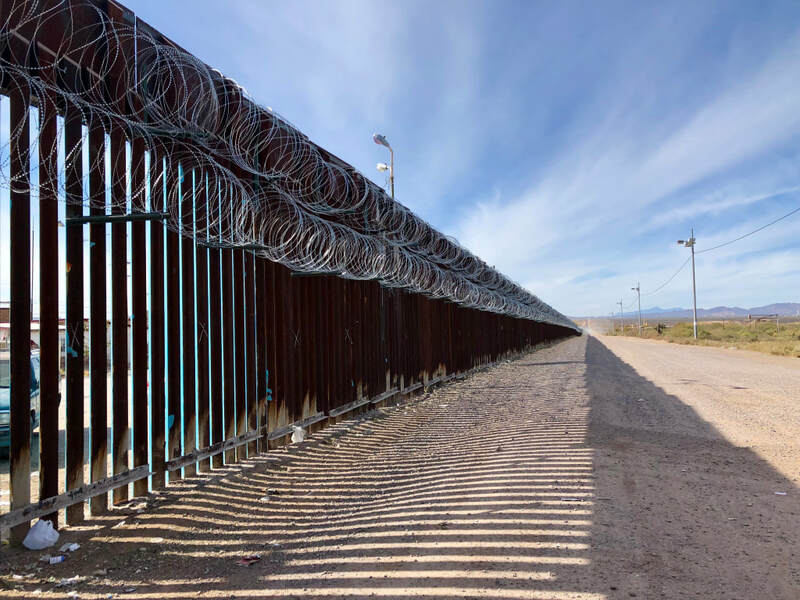 The two asylum-seekers, one 8-months pregnant with bronchitis, were made to wait in the cold for almost 24 hours since the processing office was “full.” We were told 8 asylum-seekers a day are let in at the Douglas/Agua Prieta port of entry, but in reality, we saw that maybe 1 or 2 were actually allowed to begin the long process of requesting asylum, many of which are eventually denied. We brought blankets and hot tea and sat with them as they waited, unwilling to leave in fear of losing their place in line. Because there was nothing we could do or say that would solve the problem in this moment, they only thing we could do was show up. To be present and to show our solidarity. We tried to use our privilege for something good by asking the border patrol officers that sat on the other side of the fence why they were having to wait so long. We sat as witnesses to the injustice being done to human beings each and every day along that wall. The border patrol agents did indeed have their heater turned towards our friends, but I kept asking myself, where is the humanity in this situation? Why are they made to seemingly “prove how much they want this” by waiting hours in the cold? Why is this our system? After an hour or so, when it seemed like they might want to try to get some sleep, we got up, said goodbye and good luck, and resumed our normal lives. Our outsider status was never more apparent to me as we left. We can never fully understand what it feels like to have to leave your family and your home because it’s too dangerous or unstable and flee in search of something better – but that doesn’t mean we shouldn’t try. I probably will never find out if our friends seeking asylum will be able to reunite with their family in Georgia, but I now have a better grasp of the system and know that they are a long way from the life she dreamed of. Their story is just beginning. The courage, determination, and unfailing hope our friend shared with us as she waited to seek asylum in the U.S. will remain with me always and sparked my acknowledgment of my role in the issues affecting our Southwestern border. After all, this is my border. My wall. My responsibility. And yours, too. Moving forward, I’m asking myself these questions: What does it mean to be a responsible U.S. citizen? How does our faith inform our response to social issues? For, I have called you by name. You are mine. This is my story of being called out by name to no longer ignore my responsibility. I believe that we called to do the work of God not just with our hands but with our voices. To read more from Julie, click here. However, as I moved to Albuquerque and began transitioning into being a YAV, all of that went out of the window. When the week of the Pilgrimage arrived, which also happened to be our first week of work, I was woefully unprepared and even had to be constantly reminded by my roommates that I was leaving for the weekend. Somehow, I made it with all my gear to the vans on Thursday, and the journey could begin. We started our journey at Ghost Ranch, a Presbyterian-owned retreat center and a favorite site of artist Georgia O’Keeffe. 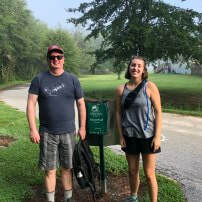 We began walking on Friday with each morning starting at 4:30 am with breakfast and an opening prayer. Though rising before the sun was not fun, it made for stunning views as it rose over the mountains and gave us a head start on the imminent heat. 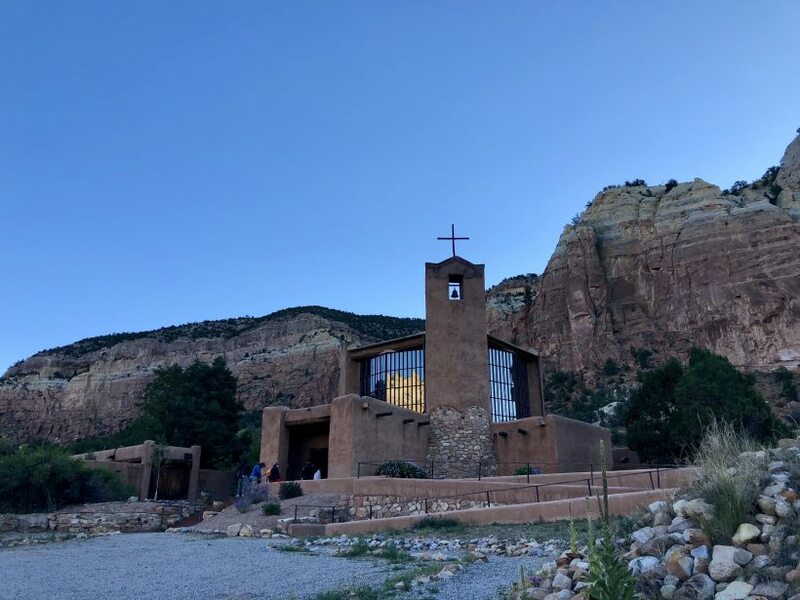 On the first day, we walked from Christ in the Desert, a Roman Catholic Benedictine monastery, and back to Ghost Ranch, about 15. 5 miles. Within the first few hours, I found myself falling into an easy rhythm. 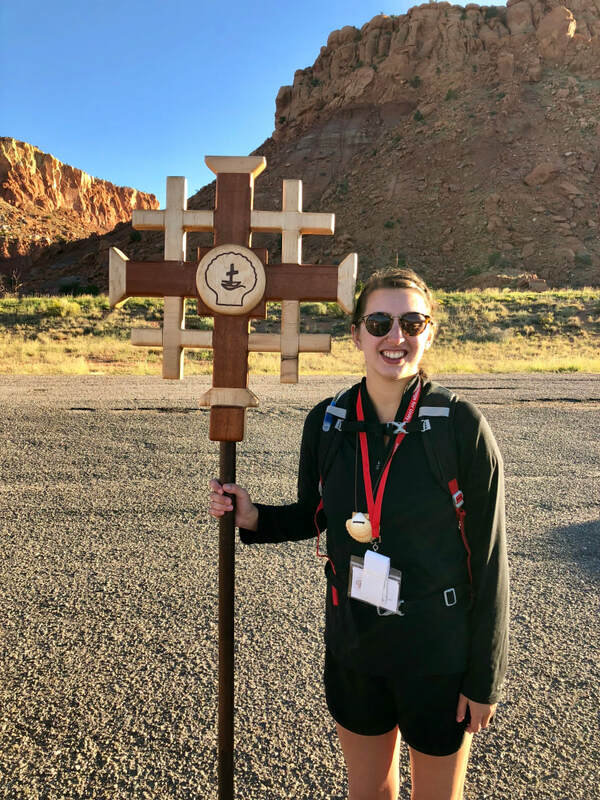 Despite the fact that I’d barely readied myself for this experience, among the 32 other pilgrims, the vast landscapes, and the prayers, silence, and singing, I felt all the stress leading up to this journey melt away. It no longer mattered that I was still not quite settled in to New Mexico life or that my job wasn’t exactly what I’d imagined. Instead, to the tune of synchronized steps in the gravel, we walked, we prayed, and we talked. Life as a pilgrim was simple, and I could finally catch my breath. This was where I was supposed to be, even if I hadn’t stopped long enough to realize it. For the next two days, we kept moving in this rhythm. 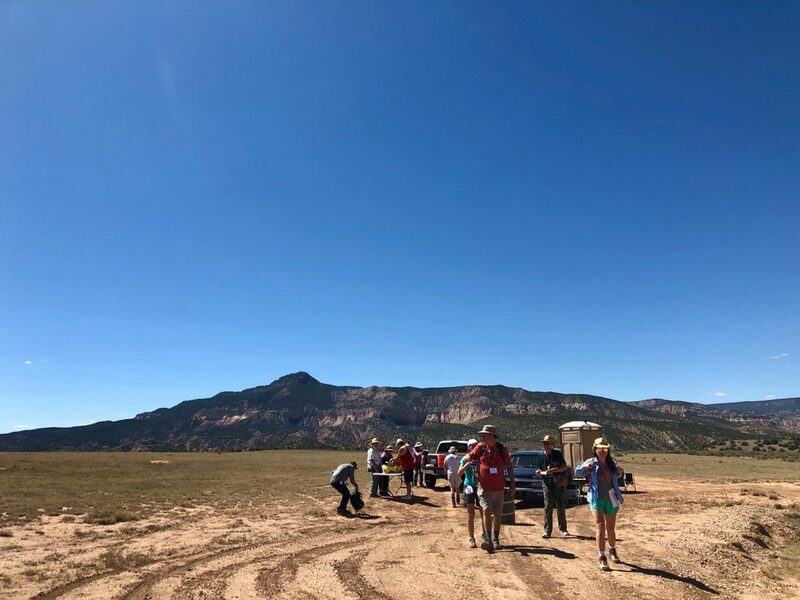 Each 2.5 miles/50 minutes, we would be met by our amazing support team with water, snacks, sunscreen, and the port-a-potty (yes, quite a luxurious trek!). After about 10 minutes, we continued on, sometimes with particular intentions for the next stretch; other times, purely focused on getting to know each other and being present in exactly where we were in our journey. Day 2 of walking brought us from Ghost Ranch along Highway 94, on a path by the Chama River, past Georgia O’Keeffe’s house, and to the historic village of Abiquiu, where we stayed for our third night in an old boarding school; a total of 17.5 miles. As I walked, I found myself constantly looking at the ground. The paths we traversed were often uneven, so in an effort not to trip, I watched my feet. 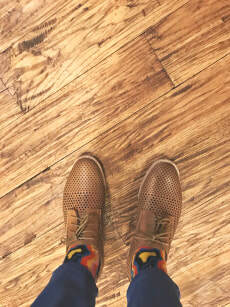 However, I realized that by focusing on my feet, I was missing so much around me. 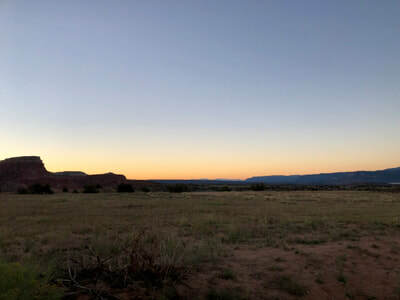 The surrounding views were breath-taking, completely different from anything I’m used to, and I was missing it. I was walking right by, focused on keeping myself safe and getting to the end. I vowed the moment I noticed this to remind myself to look up. To take in the views and the people around me – even if that meant I might stumble. This wasn’t an easy thing to remember, but I kept at, allowing myself to just soak it all in, remaining present and reflecting later. 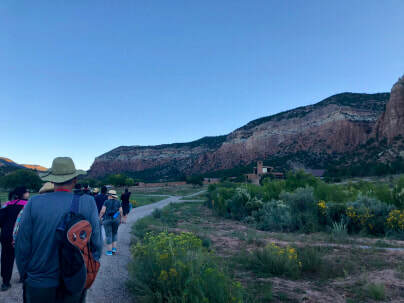 On our last day, Day 3, we walked from Hernandez, NM, through Española, and to our final destination, El Santuario de Chimayó, one of the most visited pilgrimage locations in the US and a significant site associated with healing – 14.5 miles. As we embarked on our last stretch, two miles from our lunch stop to the end in Chimayó, I was surprised that I wasn’t that excited to reach the end. 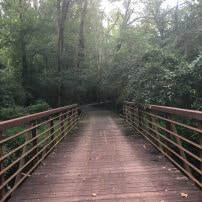 I had enjoyed walking and the simplicity and focus that it had allowed me. I was surprised to recognize that (as cheesy as it sounds) it truly wasn’t about the destination but about the journey that brought us there. If I hadn’t made the intentional effort to look up and take it all in, I would have missed it. Perhaps because I was so unprepared, I had entered into this journey with no expectations, which allowed me to truly just be. As I continue reflecting on the three days of the Pilgrimage for Unity, I am setting the challenge for myself during this next year to not forget to look up. If I’ve learned anything from this experience and my fellow Pilgrims, by cultivating a stronger awareness of the world outside of my own, I am sure to find more compassion, peace, and joy than I’ve ever known. ​I want to take a moment to express my gratitude for each person involved in the 2018 Pilgrimage for Unity. It was an experience and a community like no other and one that I will never forget. I felt welcomed, supported, and known. Thank you all for making New Mexico begin to feel like home. To read more from Julie's blog, click here! My roommate Julie & I relaxing during our down time. 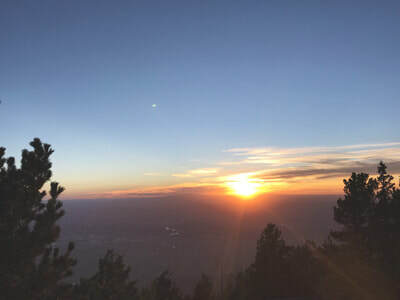 One of the first group outings was a drive up to the Sandia Crest to hike a tiny bit and watch the sunset. 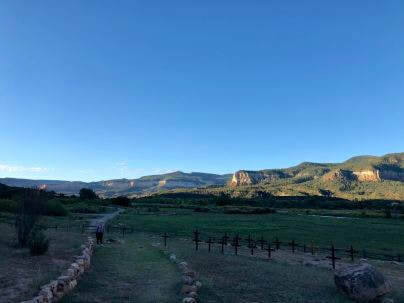 I enjoyed the beauty of the moment in two ways, one being the physical beauty of the area and the other being the organic opportunity get to know each other and the start of what will be our intentional living community for the year. The sunset picnic was a great chance to explore the area and share a meal together. Another new exciting experience was Zozobra in Santa Fe. Zozobra is a tradition where burning Zozobra (“Old Man Gloom”) is the enemy of all that is good. 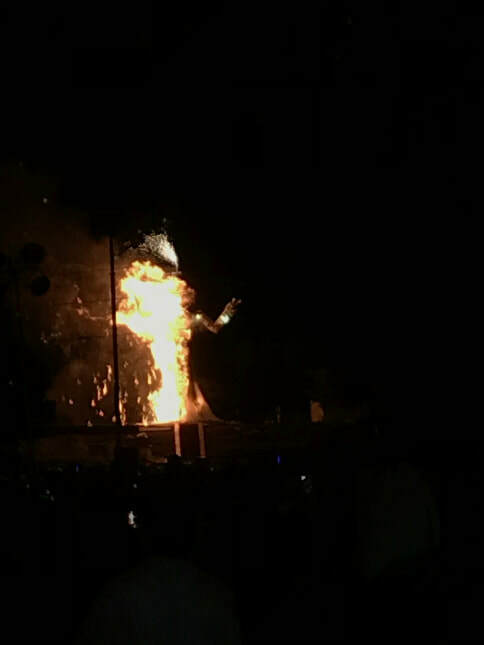 The burning of Zozobra represents the hopeful end of a years worth of darkness that had been cast over the city. 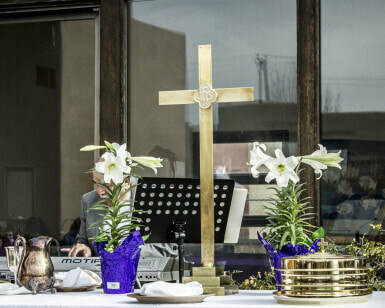 This event largely represents good trumping evil and a hopeful start to a period of celebrations in Santa Fe. It was a fun day even though it was without a doubt a long day and it rained on us because after all it is monsoon season here. 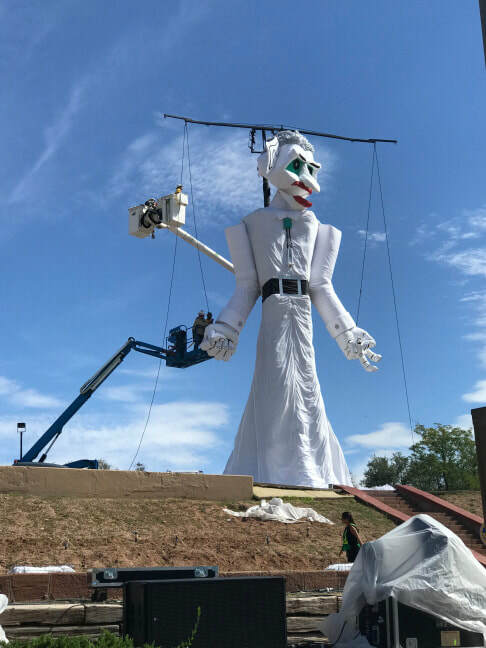 A key part of our time in Santa Fe was recognizing that Zozobra takes place on public land that is part of the Land and Water Conservation Fund which is in need of protecting. In the morning we went to a rally focused on saving the Land and Water Conservation Fund. Luke was asked to dress up as Ranger Rick and entertain the school kids who came to see Zozobra. That part of the day was hilariously entertaining for us but not a main focal cultural point of the event as a whole. Along with our trip to Santa Fe we had a chance to meet Andrew Black who grew up in Santa Fe and now serves as an associate pastor at First Presbyterian Church of Santa Fe which is the church he also grew up in. 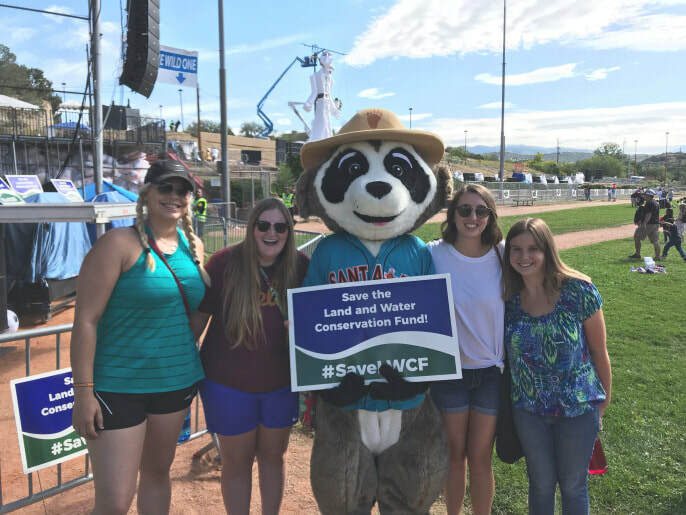 Andrew shared some history of the area, gave us a tour of the church that celebrated it’s 151st anniversary this year and explained some of the work he does with the Land and Water Conservation Fund. We spent four days of local orientation meeting our community partners and experiencing aspects of each others work placements. This year I will be working for Heading Home, a not for profit organization that is dedicated to making experiences of homelessness rare, short-lived and non recurring. 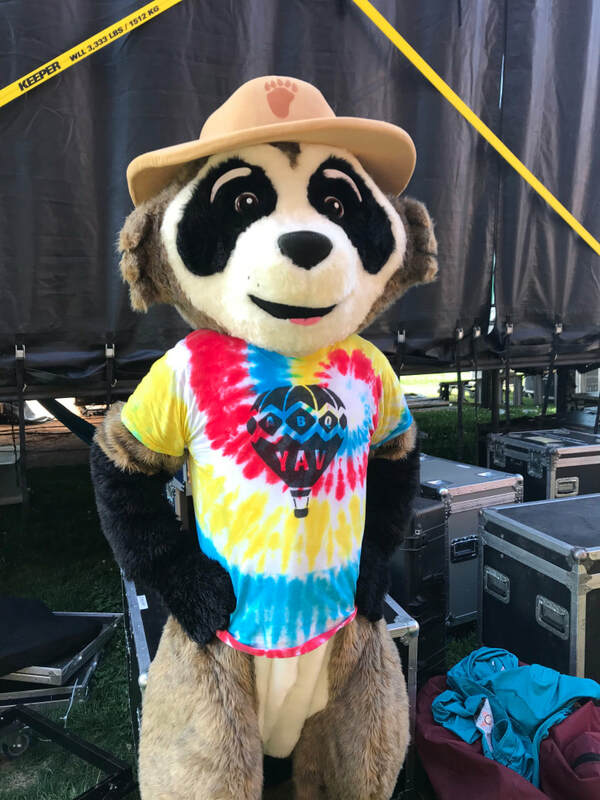 Specifically I will be the coordinator of their volunteers so throughout the year I will get the chance to familiarize myself with lots of different aspects of the organization. I think this will be a valuable learning experience for me because I may want to work for a non profit in the future. Some other community partners that my housemates will be working for and we visited are Hope Works, Menaul School, and Second Presbyterian Church. I think each of the placements will provide us with hands-on real world experiences and I feel I am well fitted with Heading Home and I also think every placement will give each of us a favorable opportunity to magnify our strengths as well as push ourselves and grow. Two unique experiences we were fortunate to have during our first two weeks were a trip to Santo Domingo Pueblo and a day in Madrid. 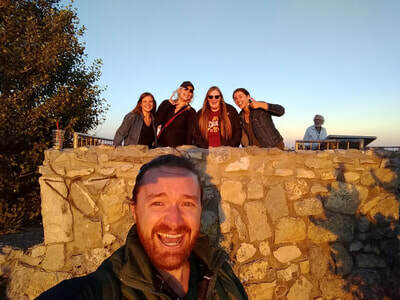 The uniqueness of the experiences was that in both cases we were invited to dig deeper, be shown around by locals and have interactive experiences with people who were willing to share their stories and history with us. 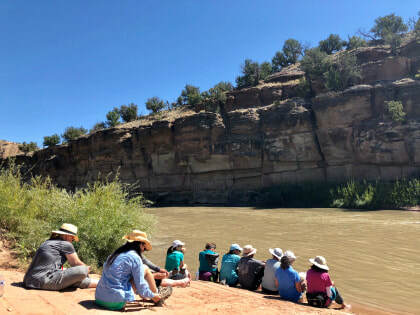 In Santo Domingo Pueblo we were invited to a feast and got to hear about life in a Native American Pueblo and examine how there is huge differences between their culture and lifestyle even though we were only 45 minutes away from Albuquerque. In Madrid we got a perspective of how a mining town turned into a ghost town and has now transformed into an arts community. 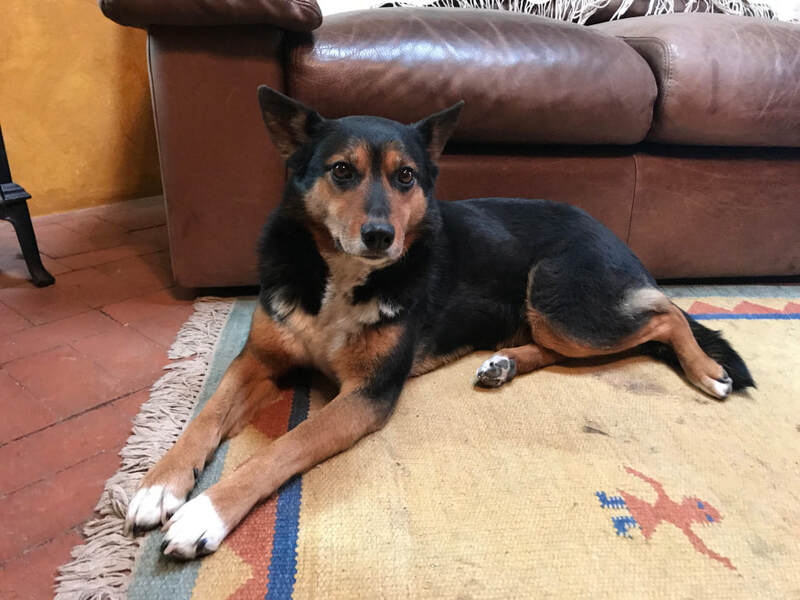 John grew up in Madrid and had a wealth of information about the changes and past that he was willing to share with us. In connection with the openness of the family in Santo Domingo and John in Madrid, I felt the start of myself investing in the community around me, taking a deeper look at cultural heritage and starting to not be a tourist but living like a local. Moving forward in this new place, a big part for me will be remembering to be mindful about walking alongside people, not trying to change or fix things for them and being conscious that I am being welcomed into a community and/or organization but that I am not needed. Also, I need to be cognizant that every person I come in contact with comes with their own valuable perspectives that matter. I find joy in the journey and I am enthusiastically awaiting my first day of work (on 9/11) as well as the rest of year inviting discomfort and knowing that it’s going to be challenging but that there is always good that comes out of the chaos and difficult conversations. To read more of Kim's blog, click here! 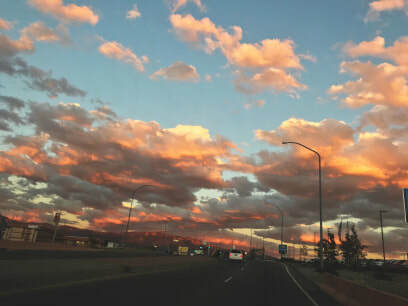 They warned me that I’d want to stay here in Albuquerque, but I didn’t take it seriously until about three months ago! 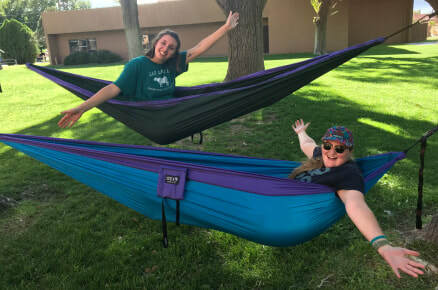 February, March, and April were filled with several opportunities for spiritual discernment, exploration, and lots of traveling! I’m happy to have had the OPPORTUNITIES to make the most out of this year and to really challenge myself to seek out what I want this next year to look like. *Truth is… I don’t really know (: but God’s hands are all over it already! 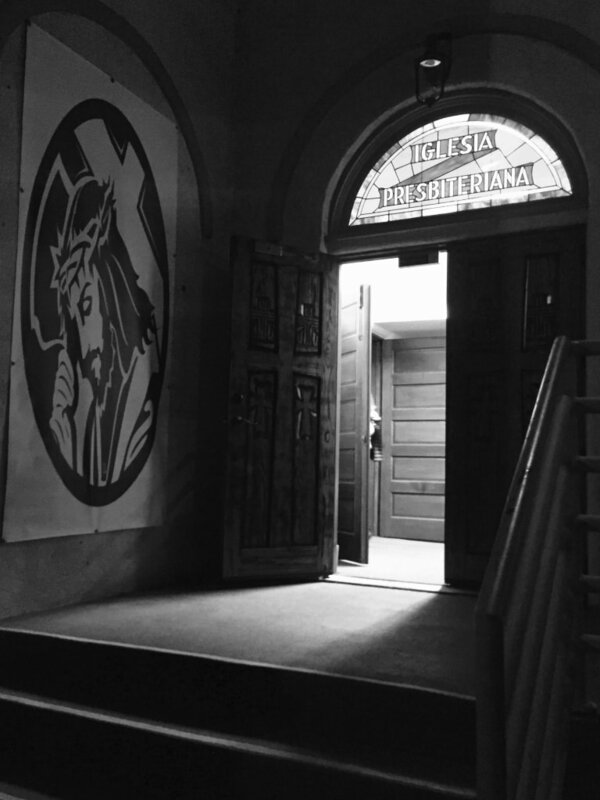 In February, I visited the West coast for the first time, by participating in a visitors weekend at the San Francisco Theological Seminary to visit their campus, as well as the Graduate Theological Union, which SFTF and eight divinity schools are a part of. In March, I was blessed to have a second trip to the Golden State of California to visit two other seminaries AND visit beloved friends from Texas. In Pasadena, I visited Fuller Theological Seminary and explored Los Angeles area with Sonja, Javier, Maureen and Manuel. Then I headed back up to the Bay Area to spend the weekend at a Signs Along the Way Discernment Weekend at the Pacific Lutheran Theological Seminary in Berkeley. 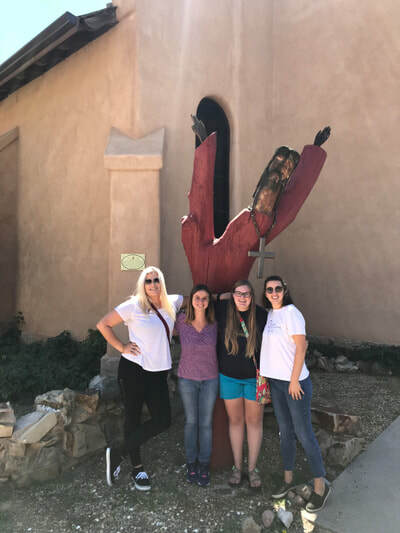 In addition, my fellow YAVs and I were invited to attend the Synod of the Southwest meeting in Phoenix, Arizona, so we had yet another fun road-trip and the opportunity to share our YAV experience, reflections, and some testimonies. 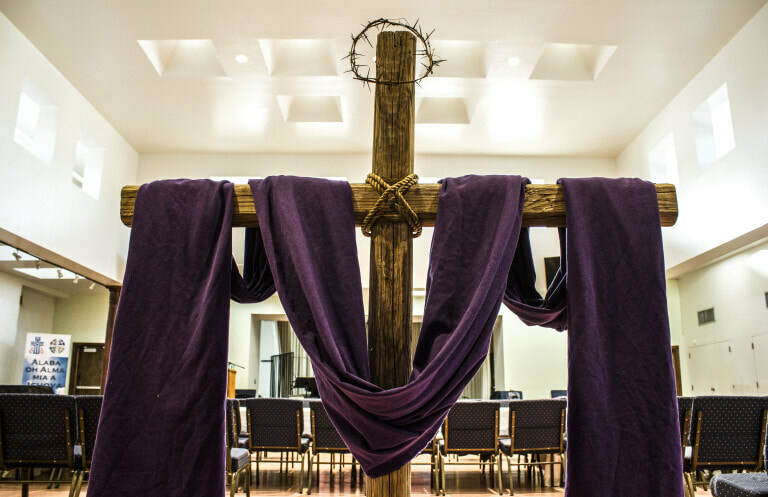 In April, I brought (figuratively and mentally) my previous seminary visits, reflection, thoughts and questions to the Forum of Theological Exploration, regional retreat in Minneapolis, MN. Through nomination through the YAV program, I was invited to attend and participate in a weekend of seminars, activities, and exploration labs – alongside 90+ other young adults among a variety of faith backgrounds, who find themselves navigating their calling through positions and areas of Christian leadership within the community and the church. ​At the FTE Retreat, we learned about building beloved community // a multi-ethnic and multi-racial community, where love is the governing aspect (Dr. Martin Luther King Jr.) in order to hold space that creates space. In addition, we had the chance to discuss and reenact the Biblical leadership roles of the: Prophet, Priest, Elder/Sage, and King; in respect to past and current movements, as well as leaders, and challenging ourselves to see the different versions of leadership we have and how to best use each role in respective atmospheres. 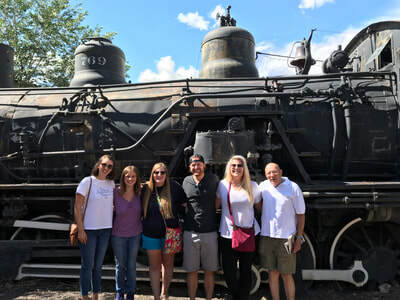 ​Once, I returned to Albuquerque – it was time to start making real decisions about what I’d be doing after my YAV year ended. I only applied to Fuller Theological Seminary and had been accepted – which I am glad about! But I wasn’t too sure about relocating to Pasadena, CA. 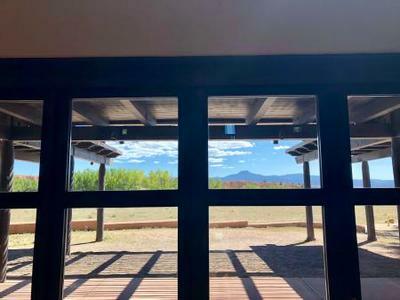 Then, I began entertaining the idea of possibly sticking around in Albuquerque for another year – but not as a YAV – simply to rent, work and continue being involved in this community I’ve grown to love. 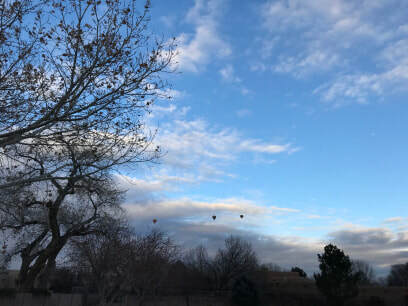 From the beginning (even before moving to Albuquerque), they said it’s the wonderful Land of Enchantment, but it’ll turn into the Land of Entrapment, convincing you to stay! So officially, I will be staying in Albuquerque for (at least) another year!!! To my delight, I haven’t been stressing about finding work – God has aligned the right community, connections and a number of part-time positions. 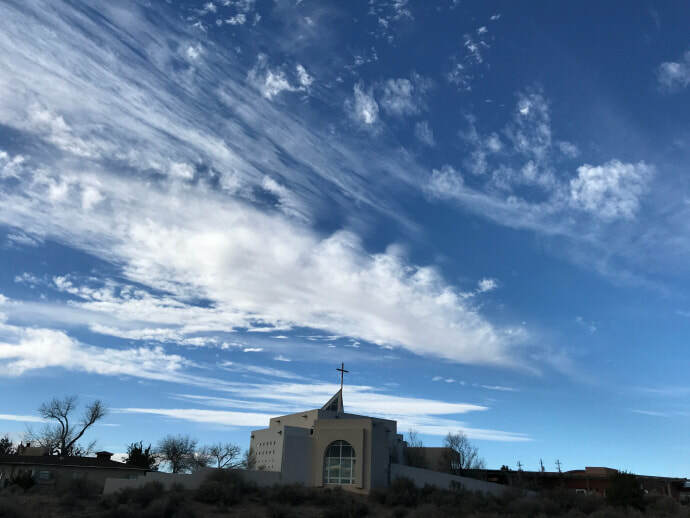 I’ll be continuing work within the church, in accepting two new positions as the Youth Group Coordinator at a local congregation, St. Andrew Presbyterian Church, and as the Communications Specialist at the Presbytery of Santa Fe (located in Albuquerque). 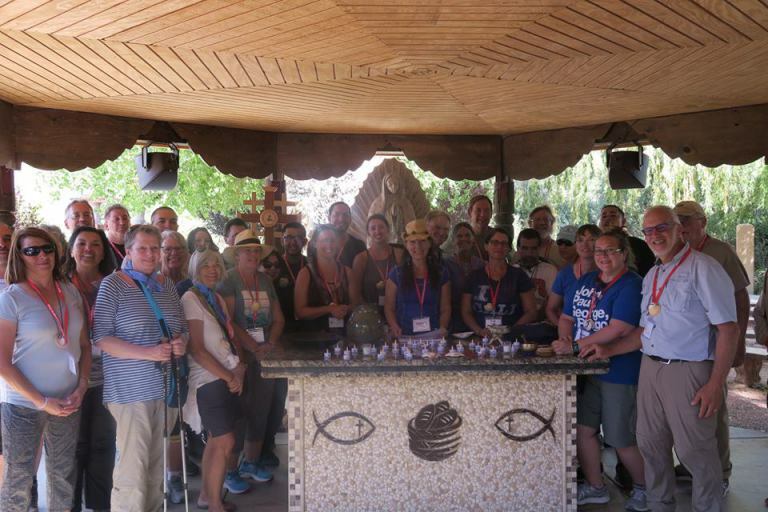 In addition, I’m excited to maintain involvement at Camino de Vida as a place of spiritual growth and connection among their community, but also as I continue assistance through the English as a Second Language program and administratively. 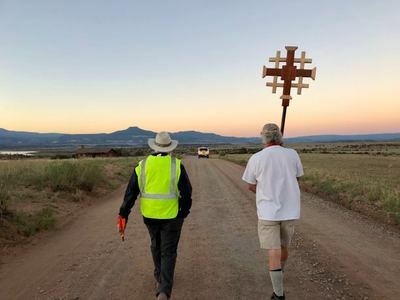 I’m beyond grateful for the variety of positions allowing me to become more involved in the Albuquerque faith community individually and at-large. *Beginning classes online at Fuller Theological Seminary is still an option for this upcoming academic year, but not 100% in the plan yet – however, I’m more than interested in pursuing the MA in Intercultural Studies when the time is right. I also hope to put my minor in photography to good use by seeking out photography opportunities for portrait and special occasion shoots. 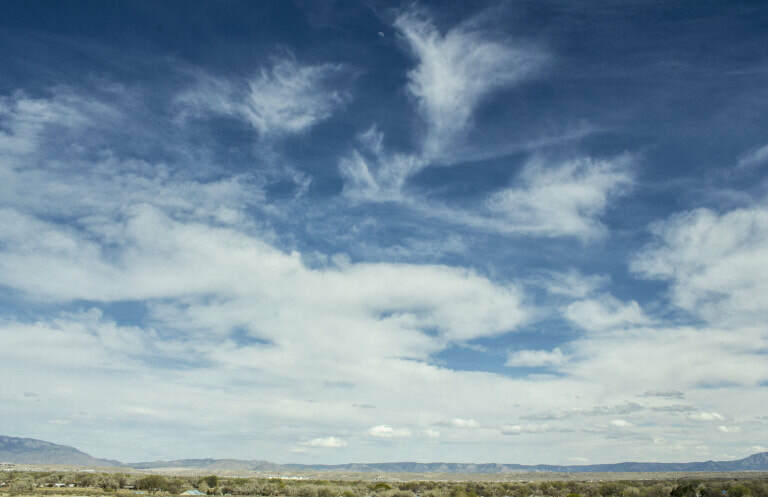 Please check out my Photography Portfolio – I’d greatly appreciate Albuquerque locals to share the word and my portfolio page for those interested! 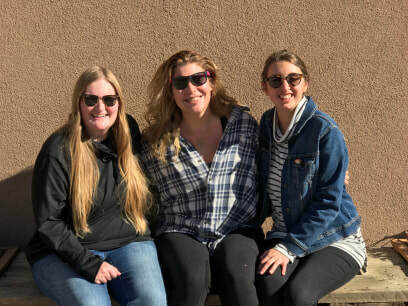 I’ve been completely blessed by a spectacular year, a welcoming Albuquerque community for this kick-off ABQ YAV site year, and the greatest group of ladies to share the experience with – as well as the greatest site coordinator Luke!!! I’m even more thankful to be staying in Albuquerque with my lovely roommate Ana, as we’ve decided to share an apartment together while she starts her undergrad locally. 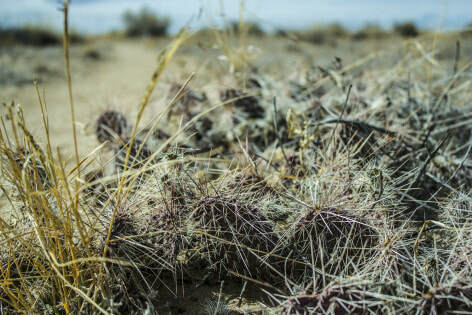 This year was unlike any Lenten journey… In my past experience of Lent, I’ve always had a hard time connecting spiritually. 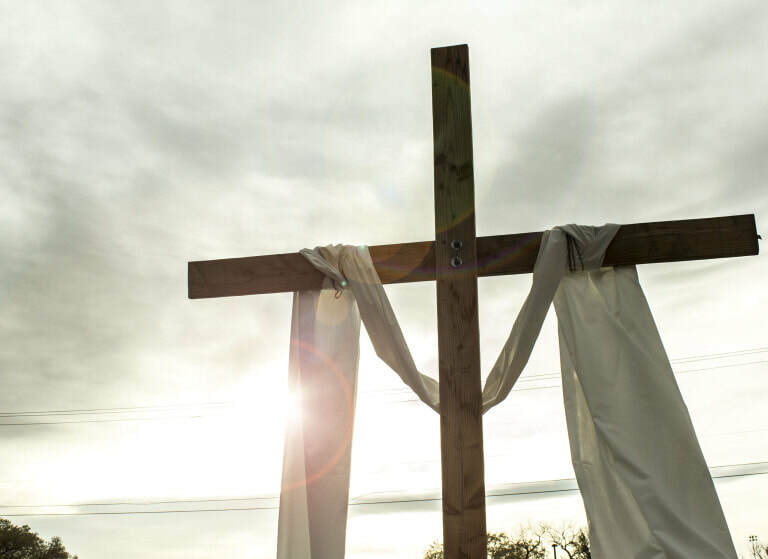 As a kid, raised in the Catholic church, I tended to connect Lent with: rules, obligation, and wondering why giving up chocolate deemed you closer to God. When really, Lent is a period of time intended to “enable us to come back to the Lord wholeheartedly and in every aspect of our life” (Pope Francis, 2018). Este año fue diferente que otros tiempos de Cuaresma… En mi experiencia pasada de Cuaresma, siempre he tenido un tiempo difícil de conectarme espiritualmente. Como una niña, criada en la iglesia católica, solía conectar Cuaresma con: reglas, obligación y preguntándome cómo no comer chocolate se hace más cercano a Dios. Cuando en realidad, la Cuaresma es un tiempo intencionado para “permitirnos a regresar al Señor de todo el corazón y en cada aspecto de nuestra vida” (Papa Francis, 2018). En un devocional previo a la Cuaresma con la Conferencia de Iglesias Luterana del Norte de Nuevo México, yo pude comenzar la Cuaresma con algunas declaraciones que las conectaba durante ese estudio. Para crear sostenibilidad en los hábitos o devociones, en lugar de tratar de dejar los hábitos sin pensar o crear otros nuevos, como si uno fuera a correr un maratón sin ninguna preparación. Para practicar el cambio adaptativo. “Creo que es el deber de la iglesia en este momento de nuestra historia para recordarnos que nuestras vidas pertenecen a Dios … Y esa pertenencia a Dios, esta prestado para nosotros en este momento, para hacer lo que podamos para ayudar a nuestro prójimo. (Obispo luterana Guy Erwin, 2018). 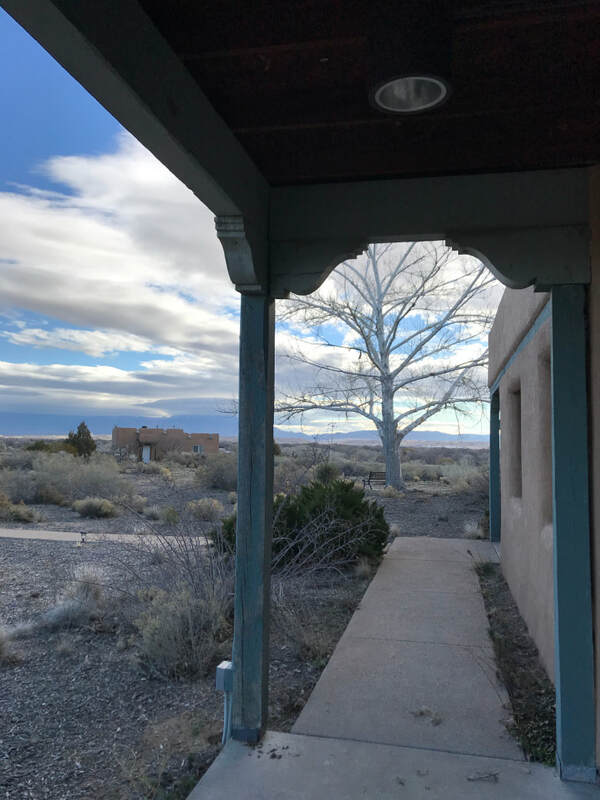 Throughout that day, I realized that most of my mornings before heading to work at Camino de Vida are normally filled with silence and solitude – and short prayers. However, the difference between all my normal mornings and this full day – is all the distractions I tend to have in front of me, such as: Phone, computer, to do’s and other desires to be productive – and cat naps. This day was meant to allow our minds and bodies to be free from commitment, doing, and even thinking about certain things. To take the time to just reflect, be silent, and be. For me, this day looked like: reading, sitting, walking around in nature, drawing, lunch, and prayer. A lo largo de ese día, me di cuenta de que la mayoría de mis mañanas antes de ir a trabajar en Camino de Vida están llenas de silencio y soledad, y cortas oraciones. Sin embargo, la diferencia entre todas mis mañanas normales y este día completo es todas las distracciones que tengo frente a mí, por ejemplo: teléfono, computadora, cosas por hacer y otros deseos de ser productivo, y siestas. Este día fue diseñado para permitir las mentes y los cuerpos para estar libres de compromiso, de hacer e incluso de pensar en ciertas cosas. Simplemente para usar el tiempo para reflexionar, estar en silencio, y ser. Para mí, este día parecía: leer, sentarse, caminar en la naturaleza, dibujar, almorzar y orar. An ecumenical group, New Mexico Conference of Churches, hosted a series which focused on exposing the Doctrine of Discovery – creating a space for understanding, healing, and further conversation and action between people of all background, especially those of European & Spanish-settler decent and Native American, as well as all living in New Mexico’s culturally diverse cities. Un grupo ecuménico, la Conferencia de Iglesias de Nuevo México, organizó una serie que se centró en exponer la Doctrina del Descubrimiento – creando un espacio para pensar y entender, para la curación, la conversación y la acción entre personas de todo tipo, especialmente las de la descendencia europea y española y nativos americanos, así como todos los que viven en las ciudades diversas en cultura de Nuevo México. 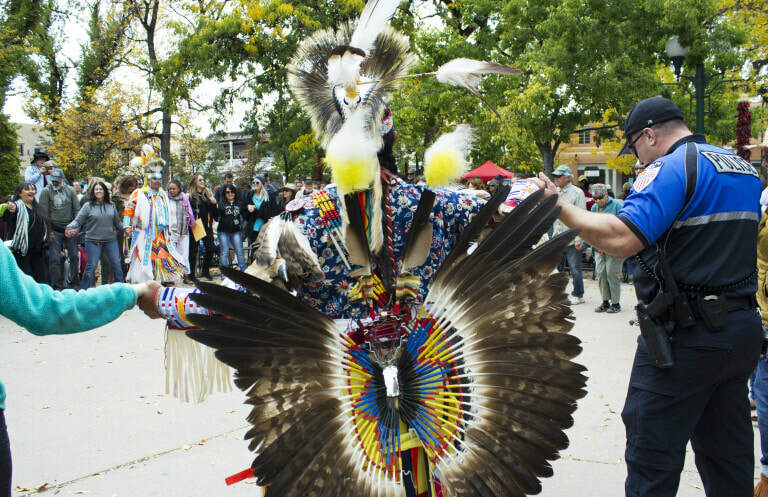 This year was the first year, for me, to formally celebrate Indigenous People’s Day, in a city that has chosen to recognize the First Land’s people, rather than the one who “discovered” already occupied land. Este año fue el primer año, para mí, para celebrar formalmente el Día del Pueblos Indígenas, en una cuidad que ha elegido reconocer a la gente que vivía en esta tierra, en vez de la persona que “descubrió” la tierra ya ocupada. “Many Americans grow up learning that this continent was “discovered” by Christopher Columbus. The concept of discovery, as if the land was empty prior to arrival and its indigenous inhabitants were somehow “less than” the explorers is, at its heart, racism and cultural superiority. “Muchos estadounidenses crecen aprendiendo que este continente fue “descubierto “por Christopher Columbus. El concepto de descubrimiento, como si la tierra estuviera vacía antes de la llegada y sus habitantes indígenas fueran de alguna manera “menos que” los exploradores, es en esencia el racismo y superioridad cultural. 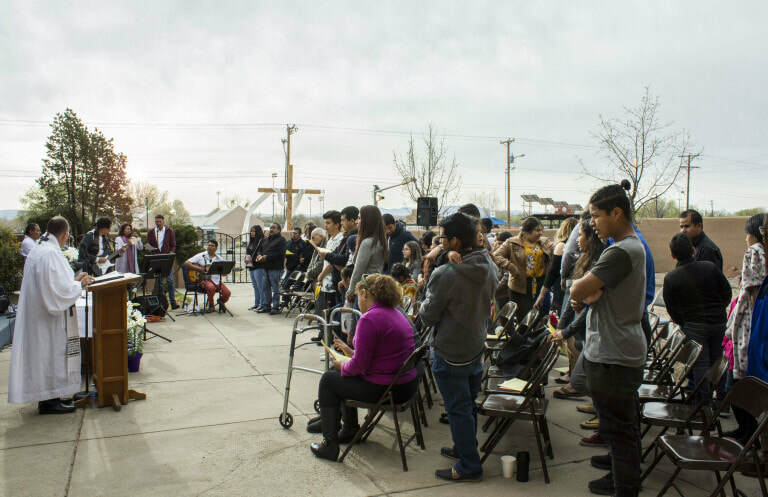 Through the program orientation to Albuquerque and the rich history of this land’s people, we quickly uncovered the wounds, past and current, but also signs of hope and healing. The hard part for Christians when exposing the Doctrine of Discovery is realizing the hand that our brothers and sisters in Christ had in this part of history. In recognizing how this document is used as justification for Christians and now the government to ‘discover’ and claim both land and superiority. For example, three days into joining my fellow YAVs in Albuquerque, we settled into our new home on the campus of the Menaul Boarding School (commonly referred to as the old Indian boarding school and later an all boys, Spanish-speaking boarding school). 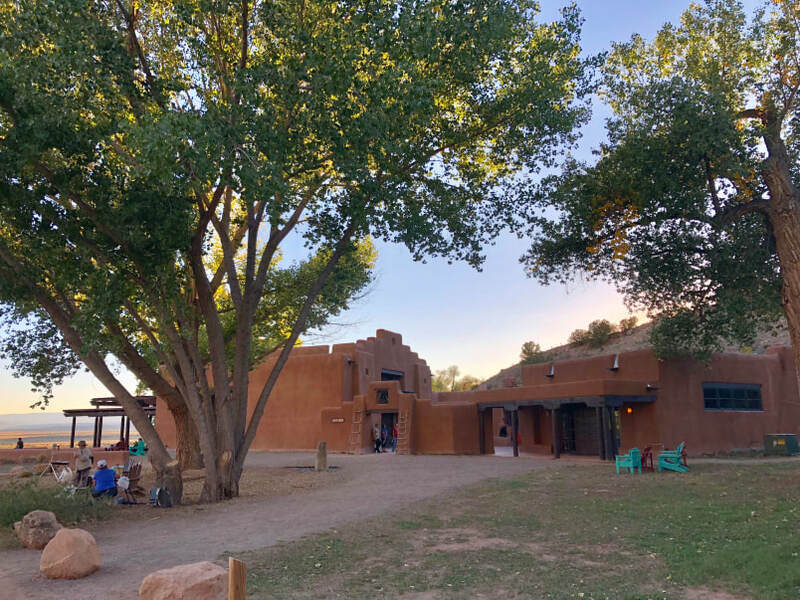 Then, we visited the Indian Pueblo Museum, learned about the number of surrounding native nations and pueblos, their culture, tradition, and history, and heard about how Native children often were forced to leave their tribes and families to assimilate into US culture and formal education – and then read about how certain denominations typically took commission in making these Indian boarding schools a reality. 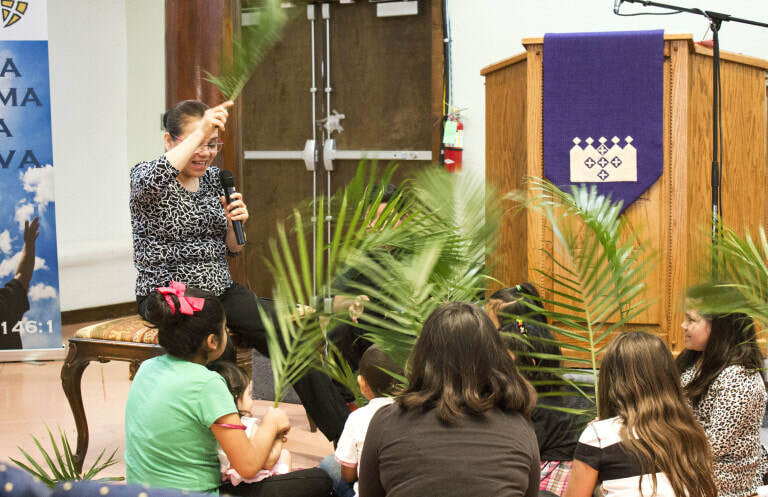 Through this Christian study in the presence of Native Americans and people of numerous backgrounds and faith, we strived to move to a place of restored relationship with God, our community, and creation. So together we created dialogue – hearing the pain and owning responsibility in the power we have today to create a space for understanding, healing, and further conversation and action – seeing the signs of hope, like our gathering and the unity of people who feel the burden of knowing , but who are striving for peace and justice. A través de la orientación del programa a Albuquerque y la historia rica de la gente de esta tierra, rápidamente descubrimos las heridas, pasadas y actuales, pero también signos de esperanza y curación. La parte difícil para los cristianos al exponer la Doctrina del Descubrimiento es darse cuenta de la mano que nuestros hermanos y hermanas en Cristo tenían en esta parte de la historia. Al reconocer cómo se usa este documento como justificación para los cristianos y ahora el gobierno para ‘descubrir’ y reclamar tanto la tierra como la superioridad. Por ejemplo, tres días después de unirme a mis compañeros de YAV en Albuquerque, entramos en nuestro nuevo hogar en el campus de Menaul Boarding School (comúnmente conocido como la antigua escuela de los Nativos y más tarde como una escuela para niños, de habla español). 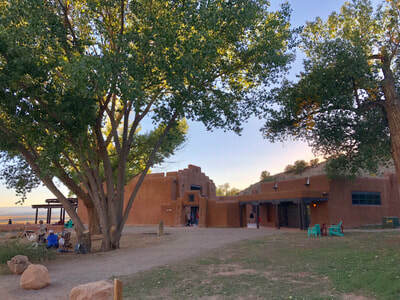 Luego, visitamos el Indian Pueblo Museum, aprendimos sobre los pueblos y naciones nativas, su cultura, tradición e historia, y escuchamos cómo los niños nativos tuvieron que abandonar sus tribus y familias para asimilarse a la cultura y sistema de educación de los estados unidos – y luego leer sobre las ciertas denominaciones que tomaron comisión para hacer de estos escuelas nativos una realidad. A través de este estudio cristiano en la presencia de los nativos americanos y personas de orígenes y fe diversos – nos tratamos a movernos a un lugar que tiene una relación restaurada con Dios, nuestra comunidad y nuestra creación. Así que juntos creamos el diálogo, escuchando el dolor y asumiendo la responsabilidad en el poder que tenemos hoy para crear un espacio para entender, y empezar la curación, la conversación y la acción. También, viendo los signos de esperanza, como nuestra reunión y la unidad de las personas que sienten la carga de saber, pero también quienes luchan por la paz y la justicia. La Semana Santa fue celebrado con mi comunidad en la iglesia Camino de Vida – Esta semana llena de gozo, celebrando nuestro Rey Resucitado en muchos servicios. 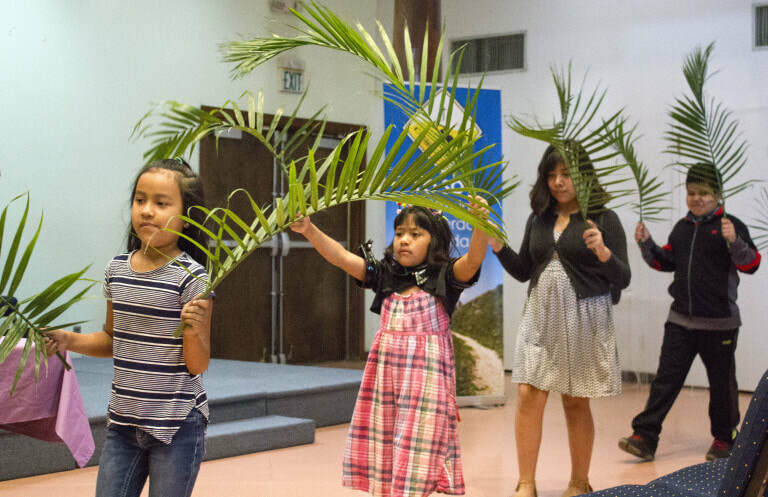 // Holy Week spent with my community at Camino de Vida was a joyous week of celebrating the Risen King in a number of services. ​After communion, the congregation took turns washing each other’s feet, as Jesus did for his disciples. To read more from Claire, click here. 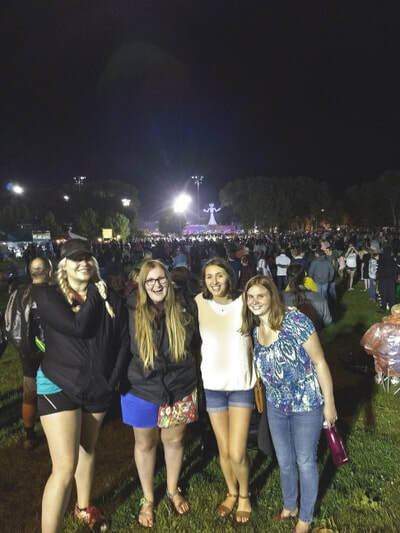 These five months of living as a Young Adult Volunteer have initiated incredible learning and growing, for sure; however, they haven’t come without necessary growing pains. I am an individual of great privilege. I am who I am today because of the opportunities, supportive communities, life-long mentors and friends, and love that I have been given. I can never adequately show my gratitude for the strength, love, and confidence you all have instilled in me. Yet, I also can’t ignore that not everyone is born into such a place of love, support, and privilege. This is not to say that I am not privileged in my current living situation either. I have a fulfilling job with supportive co-workers and wonderful students. I live in a beautiful house surrounded by strong, courageous, and engaged sister volunteers. And although we live on a budget smaller than that I have lived on before, we eat, experience life, and live very well and comfortably. So why the growing pains? 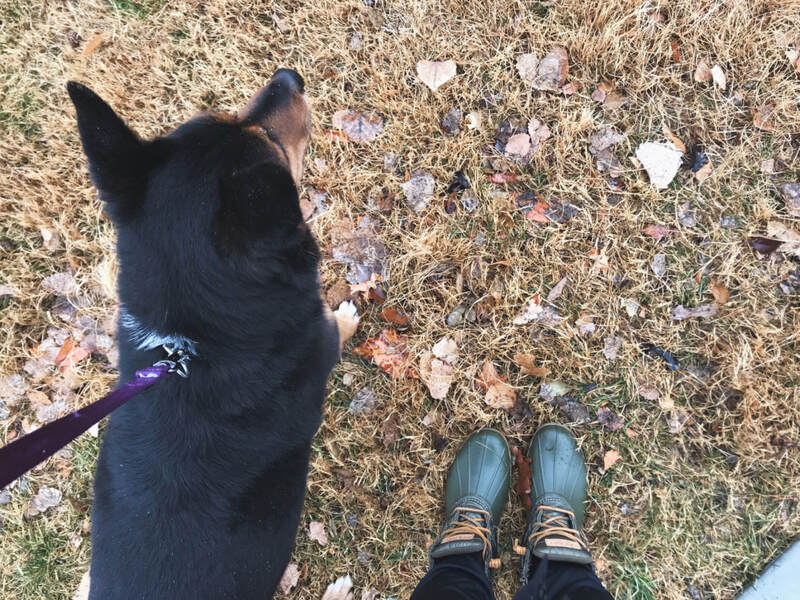 To be honest, it’s the little things that I knew I was signing up for – the things that I intentionally chose the YAV program in order to experience – that have frustrated me the most and made me most aware of my privilege and of my dependence. Over the past three summers, I have written my own curriculum and taught in my own classroom. During student teaching, I had full independence and control to teach what I wanted to and how I wanted to. Here in Albuquerque, I am working as a part-time volunteer teaching assistant. It has been hard for this perfectionist, used-to-having-control, engaged first-year teacher (that would be me) to go from teaching in my own classroom to assisting in seven different classrooms. Sometimes I feel like I am not doing enough. Sometimes I feel like things are not going how I would like them to. Sometimes I want to do more. And yet, being a teaching assistant has given me the opportunity to grow in ways that I wouldn’t if I were teaching in my own classroom. Not having to focus on lesson planning, copying papers, and always being the one to give instruction has allowed me to solely focus my energy on the students’ academic and personal needs. I am learning so much about individual student interests, struggles, and learning needs. I have more time to sit and listen to students who need someone to talk to. I have more time to go to sporting events and support students outside of school. I can work more closely with students who need one-on-one attention. I get frustrated and discouraged sometimes; however, more often than not, I am encouraged and motivated and impressed and inspired by my time with the students here. Taking a step back has been an incredibly humbling learning and growing experience. The other main source of growing pains has been not having a car. Since I was able to drive, I have never been without a family car or a personal car to drive. I am fortunate enough to have a bike to ride and the Albuquerque bus system is very affordable, but yet I still get frustrated way too frequently and easily and I often feel stuck. I had never used the public bus system before studying abroad in Costa Rica and I can still count on my two hands the number of times when I have used public transportation in the United States. Growing up, driving a car felt extremely normal and something that was a given. I am reminded frequently here that a car is a huge privilege. And the fact that I have never been without a car until now is an even bigger privilege. Being without a car makes me very dependent on the other YAVs here in New Mexico that do have cars. Although I can bike and ride the bus to a lot of places, there are just as many places that the public transit system does not travel to. And being used to lending out my car and being the designated chauffer for my friends in high school and college, it has been frustrating to have the situation flipped around here. I feel like a burden to other people if I want to do anything off campus. I feel dependent and needy. And yet, in the frustration, I recognize that feeling dependent reminds me of my shared humanity – reminds me of how dependent I really am on my friends, family, and parents. Even when at times I feel independent and strive for more independence, I can never and should never forget that I am interdependent on so many people. Even if it takes something as trivial as not having a car to drive, I am glad (although often reluctantly) for the reminder that I cannot – truly cannot – do everything on my own. I depend on other people and other people depend on me, and that is a necessary and good and solidaria thing. Coming from a place of privilege, it is hard to look that privilege in the face and put my reflections into practical action. It’s not an easy nor a quick process. Sometimes, I feel so guilty that I want to stop trying. Sometimes I feel like I am never going to kick the privileged way in which I think or act, so I wonder if it’s even worth trying. And sometimes, I savor and appreciate and feel so blessed to be learning from the times of discomfort and clarity. There are many moments when I recognize how dependent I am; and in these moments, I become frustrated. But these moments also help me recognize how dependent I am on God. Living in conscious dependence of other people and of God doesn’t mesh well with the independent way that I am told I need to live as a young adult. Ultimately, it is in this conscious dependence of my neighbors and of God that I recognize how blessed, lucky, and privileged I am to be doing exactly what I am doing right now. These are little, seemingly non-consequential, non-important things that have been my biggest struggles so far. And yet, I think sometimes, when I don’t take time to recognize, make peace with, and reconcile these little things, I miss the bigger things that God is trying to show me. The growing pains that I am experiencing through recognizing and examining my privilege are painful by nature. With hesitancy and excitement, I welcome these pains and offer myself and others grace in the process, realizing the growth that they bring. “Injustice anywhere is a threat to justice everywhere. We are caught in an inescapable network of mutuality, tied in a single garment of destiny. Whatever affects one directly, affects all indirectly.” -Dr. Martin Luther King, Jr.
About a week ago, I was walking down Central Avenue and found myself passing many people struggling with homelessness who were hanging out near the bus stops next to this highway. I suddenly became intensely aware of the expensive laptop in my bag and this looming fear of being robbed crept up within me. I then walked faster and farther away from these people, trying to keep my head down, not to make eye contact. While these grim thoughts fought for recognition, I heard this little voice inside of me (I know we are all well aware of this voice), which kept saying “this isn’t right, Beth. Why do you keep running away from your shared humanity? Do you care more about the material things you carry, rather than confronting these egotistical thoughts of assumed hierarchy which separate you from them?” I then slowed my pace, took a deep breath, and witnessed the limiting lenses of my clouded perceptions dissolve into Earth. As I let go of my attachments with the laptop, the true essence of my identity once again became visible through the many faces surrounding me. As Nobel Peace Prize winner, Priest, and Theologian Desmund Tutu explains, “My humanity is bound up in yours, for we can only be human together”. Continuing on my walk with gratitude, I watched as Holy Spirit stood by, offering a genuine smile and wave. ​You can read more from Bethany here.